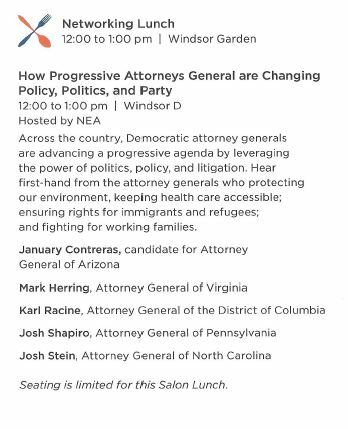 North Carolina’s Attorney General Josh Stein was a panelist at a Dark Money group summit held earlier this year. The Far Left Dark Money group, Democracy Alliance, held it’s Spring Summit at a posh resort in Atlanta, Georgia this past April. Read the full summit agenda. At the 2017 Democracy Alliance Fall Summit, AG Stein was praised by the group as one of the “State’s brightest stars.” As the Daily Haymaker noted about Stein, elections have consequences. Over the last two years, radical leftist billionaire George Soros has been pumping millions into Attorney General races across the country in an effort to stack the justice deck. His influence was found in races in Philadelphia and in Texas. Participants will learn about state models on the Left that align resources, strategies, and programs to achieve electoral and policy success. WIN Minnesota Executive Director Denise Cardinal will facilitate a conversation among DA Partner and New Mexico Donor Collaborative Chair Jim Gollin, Put North Carolina First Executive Committee Member Nina Szlosberg-Landis, and WIN Minnesota Board Chair Jeff Blodgett to explore the elements of a winning model as well as the grit, determination, and perseverance required to build, fund, and sustain these efforts over time. Participants will be encouraged to ask questions about the role donors can play to drive collaboration among state and national groups, foster aligned planning of data driven, high impact engagement and electoral campaigns, and promote a culture of accountability and learning. 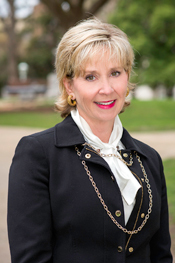 Szlosberg-Landis has been appointed to multiple positions by Democrat Governor Roy Cooper. Szlozberg-Landis was appointed to the NC Department of Transportation Board and the NC Railroad Company by Governor Cooper. In addition to her role with Put NC First, Szlosberg-Landis is a former NCDP Chair who resigned during the Randy Voller Scandal in 2013. She’s also a board member of the progressive group Lillian’s List, the NC League of Conservation Voters (NCLCV), is an advisory board member of the Environmental Defense Fund and is on the board of advisors of WakeUP Wake County Inc., which is a Blueprint NC partner. WakeUp Wake County has direct ties to the Left-leaning Great Schools In Wake Coalition, Capitol Area Friends of Transit, and Public Schools First NC (PFSNC) which is “project” of WakeUp Wake County and is run mainly by radical Yevonne Brannon. PFSNC’s partner, Great Schools In Wake, was responsible in part for the 2011 Wake school board protests alongside Rev. Barber. Brannon had used both Greater Schools in Wake and PSFNC to manipulate the practices and policies of the Wake County School Board. Szlozberg-Landis has also donated to the Coalition to Protect All NC Families and Real Jobs NC which have disseminated smear-style campaign mailer and ads. Szlosberg-Landis made a $250 Political Donation on 4/24/12 to the group. Both groups have ties to the Far Left non-profit, Progress NC. This entry was posted in BlueprintNC, LL1885, Mapping The Left, NC Dems, POLITICS NC, Roy Cooper, THE LEFT and tagged Democracy Alliance, Josh Stein, Nina Szlosberg-Landis, Roy Cooper. Bookmark the permalink.